Copper amalgams, consisting 60-70% mercury (Hg) and 30-40% copper (Cu) (1, 2), were used very commonly in Norway for children with caries – allegedly because they were thought to inhibit the development of new caries. 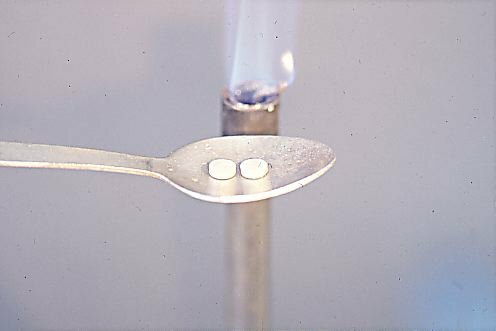 But they were used in a way making them far more dangerous for dental health personnel than other types of amalgam because the amalgam powder was heated in a metal spoon in a gas flame until Hg droplets could be observed (Fig 1). In poorly ventilated rooms, this gave an enormous Hg exposure by inhalation to the dental health personnel, but even more to the dental assistants than to the dentists. The average levels of occupational exposure to Hg among dental health personnel was earlier very high, at least in the Scandinavian countries including Norway, and in some cases (not very infrequently) excessively high (3, 4), especially in public dental health clinics with large numbers of schoolchildren as patients, where copper amalgam was used as a matter of routine to make fillings for the children because of its assumed cariostatic effect. A medical student at the University of Oslo made a student thesis, where he studied the Hg concentration in the air in dental health clinics, and in some of them found excessively high levels far exceeding (by more than a factor of 10) what was at that time the maximal permitted levels of exposure (3). This student thesis was carried out under supervision of his older brother, who was working in a leading position at the Norwegian Institute of Occupational Health. But the older brother, who had been the supervisor, did never inform the Directorate of Occupational Health about his younger brother’s observations, as nevertheless had been his duty (because of his job in a leading position at the institute) to do (Olav Albert Christophersen, personal communication). The late Dr. Hans Tjønn, who at that time was chief doctor at the Institute of Occupational Health, had suspected that the conditions at Norwegian dental health clinics were not satisfactory from the point of view of occupational hygiene, and had taken up this question in meetings both with the Norwegian Directorate of Health and professors at the Faculty of Dentistry at the University of Oslo (Olav Albert Christophersen, personal communication). But he had been assured both by the people in the Norwegian Directorate of Health and the professors at the Faculty of Dentistry that everything was O.K., and that there was no need for him to be worried (Olav Albert Christophersen, personal communication). If he had been informed about the findings of Jon Norseth, he would have had the evidence he needed to tell the people in the Norwegian Directorate of Health that their assumptions about good occupational health conditions in the Norwegian dental health clinics were far from correct (Olav Albert Christophersen, personal communication). And the Norwegian Directorate of Occupational Health had the necessary legal mandate in Norwegian law (Arbeidsmiljøloven) that it would not have been necessary for them to ask the Directorate of Health for permission in order to stop the problems. If that, historically counterfactually, had happened, several hundred Norwegian dental health assistants and dentists might have been spared for sometimes severe health problems caused by Hg poisoning, and also because of poisoning by some of those organic toxic substances that have been much used in dental health clinics, such as chloroform and hydroquinone. This article is based on/excerpted from material by Olav Albert Christophersen and Geir Bjørklund. 1. Bjørklund G. The history of dental amalgam (in Norwegian). Tidsskr Nor Laegeforen 1989; 109: 3582-3585. 2. Bjørklund G. Health authorities and copper amalgam (in Norwegian). Tenner & Helse 1995; No. 2/3: 3-6. 3. Norseth J. Exposure to mercury in public dental clinics in Oslo–an occupational hazard evaluation (in Norwegian). Nor Tannlaegeforen Tid 1977; 87: 371-376. 4. Bjørklund G. Mercury in dental workers’ occupational environment. A toxicological risk evaluation (in Norwegian). Tidsskr Nor Laegeforen 1991; 111: 948-951.